William Floyd students designed and built two lifeguard stands for Hither Hills State Park in Montauk, NY. Montauk, NY - November 7th, 2013 - Students in Matthew Van Horne’s Advanced Carpentry class at William Floyd High School recently completed a project to design and build two lifeguard chairs for Hither Hills State Park in Montauk, NY. 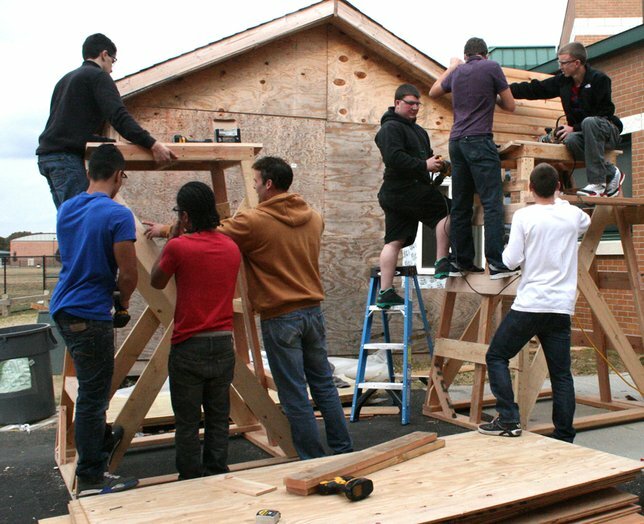 Students created the blueprints for the chairs, which stand approximately nine feet tall, on a CAD (computer-aided design) program; then spent approximately two weeks sanding, sawing, nailing and painting the structures. The wood and materials were donated by the New York State Office of Parks, Recreation and Historic Preservation, which oversees Hither Hills State Park. Students in Matthew Van Horne’s Advanced Carpentry class at William Floyd High School designed and built two lifeguard chairs for Hither Hills State Park in Montauk, NY. Subject: LongIsland.com - Your Name sent you Article details of "William Floyd High School Advanced Carpentry Students Build and Design Lifeguard Stands"